The beginning of a new NFL season brings with it the first edition of 32 Observations by PFF Analyst Mark Chichester, finding an interesting piece of information about all 32 teams after four weeks of preseason football. If you would like to make some observations of your own, you can do so with PFF Elite, where you can find several signature statistics for every offensive and defensive position in football, thanks to Premium Stats 2.0. Buffalo Bills: Wide receiver Robert Foster‘s average depth of target sat at a whopping 32.3 yards downfield during the 2018 preseason. This is the deepest depth of target that we’ve seen since PFF started grading preseason games back in 2013. Miami Dolphins: 62.7 percent of running back Kenyan Drake‘s rushing yards came from breakaway runs (runs of 15-plus yards) this preseason, which was the fourth-highest rate among running backs. New England Patriots: Safety Damarius Travis produced for five defensive stops on third down this preseason, which was the most among safeties and tied with Carl Lawson for the most among all defensive players in the league. New York Jets: Linebacker Neville Hewitt was the first defender to make contact with the ball carrier on 19 of his defensive snaps this preseason, which was the third-best mark among linebackers. Baltimore Ravens: Running back Mark Thompson forced a total of 19 missed tackles this preseason, 15 as a runner and four as a receiver. His 19 total forced missed tackles were the second-most ever recorded by a running back in a preseason. Cincinnati Bengals: Third-year cornerback KeiVarae Russell was targeted in coverage six times on deep passes during the preseason. He didn’t allow a single reception, forcing two incompletions, coming away with one interception and allowing a 0.0 passer rating — the best mark among cornerbacks with at least five deep targets this preseason. Cleveland Browns: First overall pick Baker Mayfield produced a passer rating of 121.1 when he was kept clean from defensive pressure this preseason, which paced the league’s rookie signal-callers and is the third-best mark ever recorded by a rookie quarterback with at least 40 clean pass attempts in a preseason. Pittsburgh Steelers: Rookie wide receiver James Washington was targeted seven times on deep passes this preseason, and he caught five of those targets for two touchdowns. His 150 deep receiving yards and his 153.3 WR rating on deep passes both led the league’s wide receivers this preseason and are both the second-best marks ever recorded by a rookie wide receiver. Houston Texans: Interior defensive lineman Brandon Dunn accumulated a run-stop percentage of 30.0 percent this preseason, the best mark that we’ve recorded for a defensive tackle in six years of grading the preseason. Indianapolis Colts: Interior defensive lineman Hassan Ridgeway logged five defensive stops and three tackles for loss or no gain against the run on first down this preseason, both of which ranked first among interior defensive linemen. Jacksonville Jaguars: Third-year running back Brandon Wilds was stopped for zero or negative yardage on just 11.1 percent of his rushing attempts this preseason, which was the best rate among running backs with at least 25 rush attempts. Tennessee Titans: In four preseason games, the Titans defense missed just 20 tackle attempts — the third-fewest among defenses. Denver Broncos: Rookie linebacker Josey Jewell recorded 10 defensive stops against the run this preseason, good for second-most among linebackers. Within those 10 stops were five tackles for loss or no gain, which was the most by a rookie linebacker since 2013. Kansas City Chiefs: Wide receiver Tyreek Hill saw 11 ‘open’ (at least a yard of separation) targets during the preseason, the most among the league’s wide receivers. He caught all 11 of those passes for 143 yards and one touchdown. Los Angeles Chargers: The Chargers only blitzed 31 times during the preseason, but they produced pressure on 61.3 percent of those blitzes — the highest pressure rate among defenses. Oakland Raiders: Rookie wide receiver Marcell Ateman averaged 2.85 yards per route run on his third-down passing routes this preseason, which ranked second among all receivers with at least 25 third-down snaps in route. Dallas Cowboys: Cornerback Chidobe Awuzie was targeted five times after he lined up in press coverage this preseason. He didn’t allow a single reception, forced two incompletions and came away with an interception. He allowed a passer rating of 0.0, which tied for the best mark among cornerbacks with at least five targets in press coverage. New York Giants: Safety Andrew Adams produced eight defensive stops against the run when he lined up within eight yards of the line of scrimmage this preseason — the most we’ve ever seen from a safety in preseason play. Philadelphia Eagles: Edge defender Steven Means finished the preseason with 19 total impact plays (15 total quarterback pressures and four other defensive stops), which were the most among the league’s edge-rushers. Over the last three preseason campaigns, Means has racked up 50 total impact plays — two more than the next closest edge-defender. Washington Redskins: Rookie linebacker Shaun Dion-Hamilton hit the opposing running back in the backfield a total of 10 times in his four preseason games, which was more than any other defensive player in the league. Chicago Bears: Rookie wide receiver Javon Wims accumulated 132 receiving yards from the slot this preseason, most among receivers this year and the fourth-most ever recorded by a rookie in the preseason. Detroit Lions: No rookie receiver saw more catchable targets without dropping a pass than Brandon Powell. He hauled in all 16 of his catchable passes this preseason, one more than the next closest receiver. He also forced four missed tackles as a receiver, which also led all first-year players at the position. 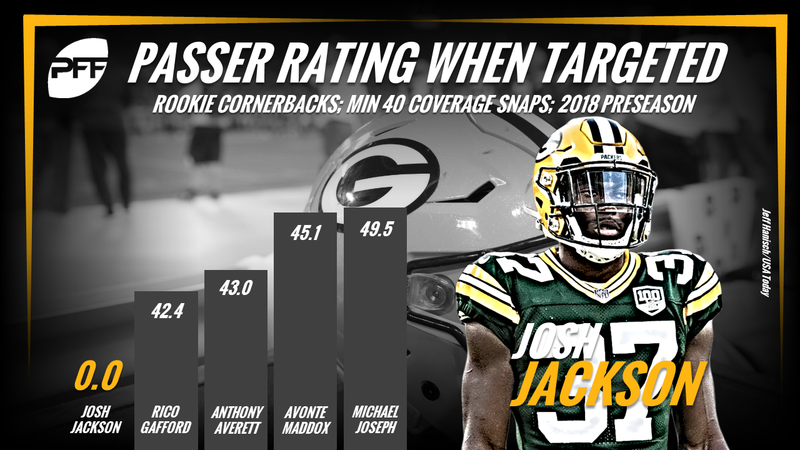 Green Bay Packers: This preseason, rookie cornerback Josh Jackson was targeted nine times in coverage, and he made as many plays on the ball (one interception and one pass break up) as the number of receptions he allowed (2). Jackson now joins Vernon Hargreaves (2016) and Josh Hawkins (2016) as the only rookie cornerbacks to have seen at least five targets in preseason action and allow a 0.0 passer rating. Minnesota Vikings: Rookie offensive tackle Brian O’Neill didn’t allow a single quarterback pressure on 92 pass-blocking snaps. In six years of preseason grading, no other offensive tackle has gone more than 75 pass-blocks without yielding a pressure. Atlanta Falcons: Rookie wide receiver Calvin Ridley was targeted on 32.4 percent of his routes this preseason, the highest rate among receivers with at last 30 snaps in route. Carolina Panthers: In the 2017 preseason, running back Christian McCaffrey rushed the ball 17 times and managed just 29 yards after contact, at an average of just 1.71 yards after contact per attempt. This preseason, however, McCaffrey rushed the ball 21 times and racked up 131 yards after contact at an average 6.24 yards after contact per attempt. The difference of 4.53 yards is the biggest among running backs who logged at least five rushing attempts in each of the last two preseasons. New Orleans Saints: On average, the Saints running backs averaged 2. 62 yards before contact per rush attempt this preseason. This was the best mark among offenses. 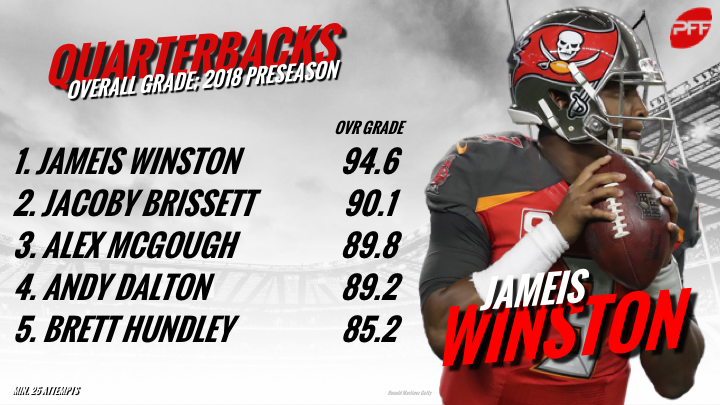 Tampa Bay Buccaneers: 81.7 percent of quarterback Jameis Winston‘s passing yards came in the air this preseason, the highest rate among quarterbacks with at least 20 attempts. Teammate Ryan Fitzpatrick ended the preseason ranked second, with 80.3 percent of his passing yards coming in the air. Arizona Cardinals: When quarterback Josh Rosen took 2.6 seconds or longer to throw, he completed 8-of-13 targets for 81 yards, one touchdown and one ‘big-time throw,’ all good for a passer rating of 105.0 — the fifth-best mark among rookie quarterbacks. However, when he opted for less than 2.6 seconds to throw the ball, he completed 8-of-16 attempts for 67 yards and no touchdowns, which drops his passer rating down to 61.2, which ranks 17th among 20 rookie quarterbacks with at least 10 attempts. Los Angeles Rams: Former undrafted free agent Ethan Westbrooks only played 57 snaps for the Rams this preseason, but he still managed to rack up three sacks, two quarterback hits, three quarterback hurries, and two other defensive stops for his team. He averaged an impact play (pressures, defensive stops or batted passes) once every 5.7 snaps – the best rate among interior defensive linemen. San Francisco 49ers: As a team against the run, the 49ers defense combined to tally 74 defensive stops and 29 tackles at or behind the line of scrimmage — both of which ranked first among the NFL’s 32 defenses. Seattle Seahawks: Rookie edge-rusher Rasheem Green produced two sacks, two quarterback hits and three quarterback hurries on just 29 third-down pass-rush snaps this preseason. All told, he won 24.1 percent of his third-down pass-rushing matchups in preseason action — by far the best rate among rookie edge defenders.